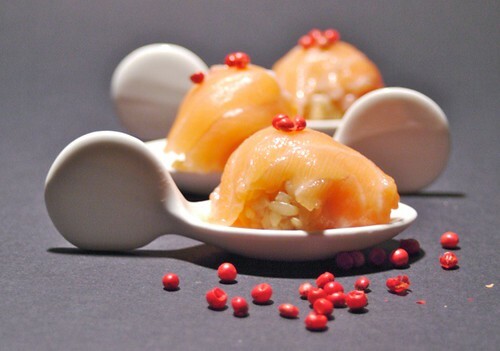 Once cooled, decided to make some little nice bowl, lay them on individual spoons, cover them with a thin slice of salmon fillet, and add over it some berries of pink pepper… I have to say that rwa salmon and pink pepper work like a blast: they are wonderful!!! Salmon is my favorite type of sashimi! I can totally eat a whole platter of it by myself…in addition to a full Japanese dinner. Hello Sara, I have come to your blog several times and every time I enjoy your recipes and style. Thus, I am giving you the You Made my Day Award! I was myself given this fun award by Aurea who was given it by …. Hope you’ll enjoy this trip into other blogs! Sara – where did you get those lovely little spoons??!?!? I am smitten! I echo Katie’s comment above! The little spoons almost steal the show 🙂 Looking forward to reading about your salmon adventures. Sara I am so fortunate. I had a blogger friend send me some of these exact spoons! They are beautiful and I will treasure them forever. I love you blog and pictures. The You Made my Day award is a way of getting people who regulalry visit other blogs to know about you. THere are a few quick simple steps to follow, so if you’re interested in going places you may not otherwise go, please refer to my post.